Rising concern over Syria's historic world heritage sites prompts scientific, archaeological and religious organizations to call for increased local and international pressure on Syria to stop the destruction of their cultural heritage. Municipal workers from Barcelona Municipal Services (BSM) called a 24 hour strike today, Monday, October 1, 2012, with over 400 workers demonstrating in the streets of Barcelona in protest against budget cuts, including Christmas bonuses, being implemented in accordance with austerity laws approved by the Spanish government. The workers want to negotiate a solution with Municipal Services that would allow them to recover an economic loss that represents a 14% cut in their wages. The 30th annual Pharaohs International Rally kicked off on Monday, October 1, 2012 near the Giza pyramids, to the enthusiasm of an international crowd waiting to see which top international competitor will come out ahead. Top contenders for the race include Emirati driver Khalifa al-Mutaiwei and French driver Jean-Louis Schlesser. Barcelona, Spain. Municipal workers from Barcelona Municipal Services (BSM) called a 24 hour strike today, Monday, October 1, 2012, with over 400 workers demonstrating in the streets of Barcelona in protest against budget cuts, including Christmas bonuses, being implemented in accordance with a decree approved by the Spanish government. The workers want to negotiate a solution with Municipal Services that would allow them to recover an economic loss that represents a 14% cut in their wages. Barcelona, Spain. Jornada de huelga de los trabajadores municipales de Barcelona. 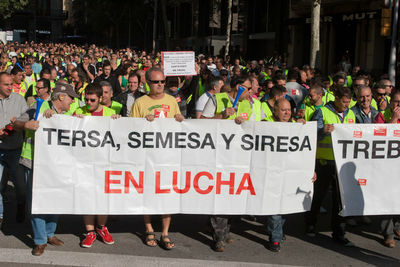 Los sindicatos cifran en más del 90% el seguimiento de la huelga de 24 horas convocada para hoy por los trabajadores de la empresa Barcelona Serveis Municipals (BSM). Más de 400 trabajadores se han manifestado por las calles de Barcelona. Protestan contra el recorte de la paga de Navidad que se les quiere aplicar en cumplimiento del decreto-ley aprobado por el Gobierno español. Quieren negociar con la empresa vías de solución que les permita recuperar la pérdida económica que ya les supone un recorte superior al 14% de sus salarios. 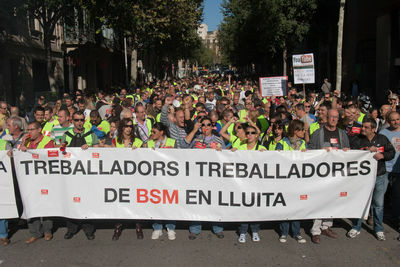 Municipal workers from Barcelona Municipal Services (BSM) called a 24 hour strike today, Monday, October 1, 2012, with over 400 workers demonstrating in the streets of Barcelona in protest against budget cuts, including Christmas bonuses, being implemented in accordance with a decree approved by the Spanish government. The workers want to negotiate a solution with Municipal Services that would allow them to recover an economic loss that represents a 14% cut in their wages. Barcelona, Spain. 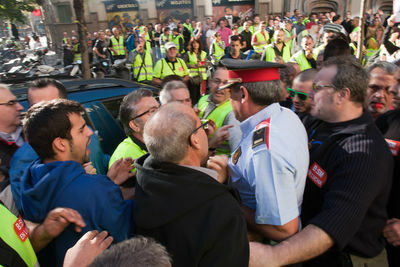 Pequeño altercado de unos manifestantes con un Mosso d'Esquadra (Policia Autonómico) durante la manifestación. Jornada de huelga de los trabajadores municipales de Barcelona. 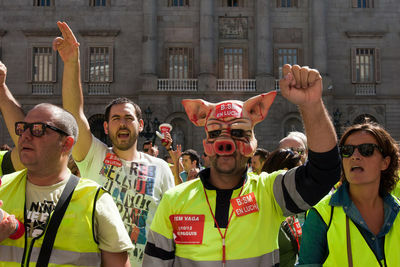 Los sindicatos cifran en más del 90% el seguimiento de la huelga de 24 horas convocada para hoy por los trabajadores de la empresa Barcelona Serveis Municipals (BSM). Más de 400 trabajadores se han manifestado por las calles de Barcelona. Protestan contra el recorte de la paga de Navidad que se les quiere aplicar en cumplimiento del decreto-ley aprobado por el Gobierno español. Quieren negociar con la empresa vías de solución que les permita recuperar la pérdida económica que ya les supone un recorte superior al 14% de sus salarios. Thousands of Bahraini people participated today in the funeral of the youth Mohammed Ali Mushaima (23 years old) at Aldaih village - west of the capital Manama. Mushaima passed away in custody after neglecting his deteriorated medical condition by the prison administration. Mohammed was arrested from the hospital by the army last year while he was receiving his treatment of sickle cell disease. He was sentenced for 7 years. He complained from a sickle cell disease crisis few day ago and the prison administration neglected his complains. He was shifted to Salmaniya medical compels thence and died there Tuesday morning. 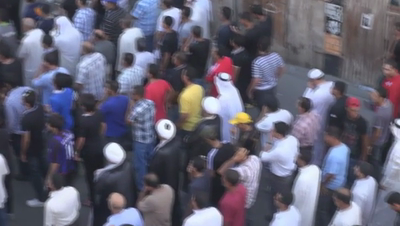 The thousands of mourners that attended the funeral, shouted angrily against the King Hamad and the royal family condemning them for the death of the detained protester. This new crime is only 3 days after killing a child martyr at Saddad village -western south of the capital Manama- by attacking him through shotgun from a very close distance. These human rights violations came only few days after the Geneva session where the Bahraini regime accepted the international community recommendations.